High quality Non-woven fabric, Made by Hand. Length: 23inch, Width: 27inch, Hat: 10inch, Bag: 8*8inch. 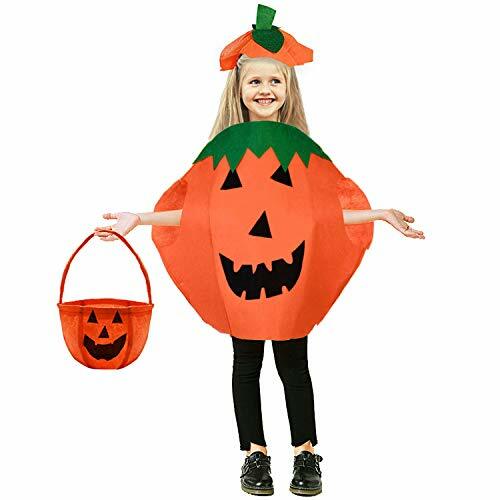 ♣ABOUT MATRIAL - Our kids pumpkin costume set is made of High quality Non-woven fabric, hand-made, attractive and durable. ♣3 PACK SET-The Affordable set included 1pc kids pumpkin costume, 1pc pumpkin hat and 1pc pumpkin candy bag. Every kids will loves it very much. ♣GIFT IDEA -- Halloween is coming! Creates a vivid character, make children looks more adorable. Enjoy your little Lovely Pumpkin~ Perfect gift for your children, grandchildren and relatives' kids. ♣AFTER SALE SERVICE -- Your experience with the products is our guideline. If any concerns, send us an e-mail and we will get to you in 24 HOURS. If you will not love them send them back for a NEW set or full refund! No questions asked! That's why your order is backed up Phenomenal Customer Service. If you have any questions about this product by TiiMi Party, contact us by completing and submitting the form below. If you are looking for a specif part number, please include it with your message.